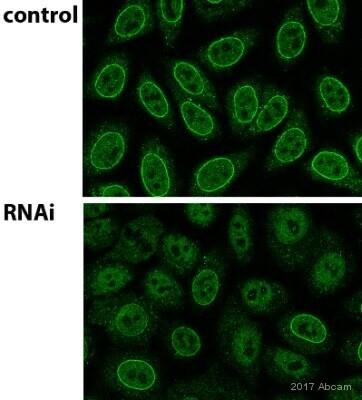 HeLa whole cell lysate (ab150035) and HeLa cells. Our Abpromise guarantee covers the use of ab64276 in the following tested applications. WB 1/1000. 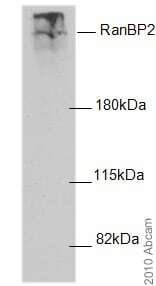 Detects a band of approximately 358 kDa (predicted molecular weight: 358 kDa). E3 SUMO-protein ligase which facilitates SUMO1 and SUMO2 conjugation by UBE2I. Involved in transport factor (Ran-GTP, karyopherin)-mediated protein import via the F-G repeat-containing domain which acts as a docking site for substrates. Could also have isomerase or chaperone activity and may bind RNA or DNA. Component of the nuclear export pathway. Specific docking site for the nuclear export factor exportin-1. Defects in RANBP2 are the cause of susceptibility to encephalopathy acute necrotizing type 1 (ANE1) [MIM:608033]. A rapidly progressive encephalopathy manifesting in susceptibile individuals with seizures and coma. It can occur within days in otherwise healthy children after common viral infections such as influenza and parainfluenza, without evidence of viral infection of the brain or inflammatory cell infiltration. Brain T2-weighted magnetic resonance imaging reveals characteristic symmetric lesions present in the thalami, pons and brainstem. Contains 1 PPIase cyclophilin-type domain. 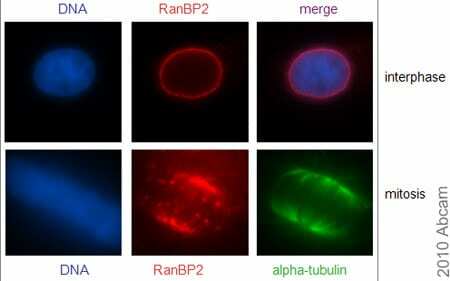 Contains 8 RanBP2-type zinc fingers. 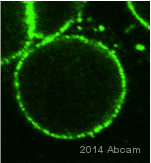 Polyubiquitinated by PARK2, which leads to proteasomal degradation. Nucleus > nuclear pore complex. Cytoplasmic filaments. ab64276 (1:2000) staining RanBP2 in Hela cells pre-extracted in 0.005% digitonin and fixed in 3.7% PFA/30 mM sucrose/PBS for 15 min (room temperature). Image kindly provided by Patrizia Lavia, Univ. "La Sapienza", CNR, Italy. 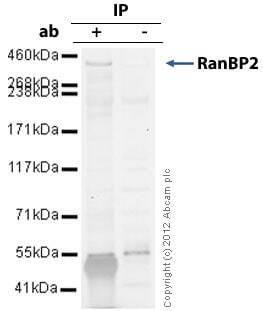 RanBP2 was immunoprecipitated using 0.5mg Hela whole cell extract, 5µg of Rabbit polyclonal to RanBP2 and 50µl of protein G magnetic beads (+). No antibody was added to the control (-). 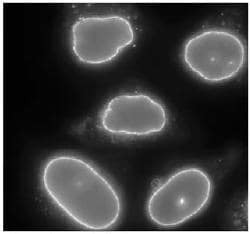 Proteins were eluted by addition of 40µl SDS loading buffer and incubated for 10min at 70oC; 10µl of each sample was separated on a SDS PAGE gel, transferred to a nitrocellulose membrane, blocked with 5% BSA and probed with ab64276. Secondary: Mouse monoclonal [SB62a] Secondary Antibody to Rabbit IgG light chain (HRP) (ab99697) . 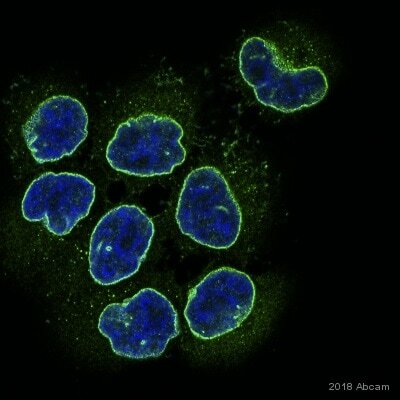 Immunofluorescent staining of paraformaldehyde fixed HeLa cells by ab64276 (1:2000). WB performed on a 6%SDS-PAGE gel. Image Kindly provided by Patrizia Lavia, University "La Sapienza", CNR, Italy. Publishing research using ab64276? Please let us know so that we can cite the reference in this datasheet.